We held a seminar on the topic of being agile in the entire organization. Not just within IT-development, not just within IT, but throughout the entire organization. We learned that the generation just starting their work-life now – has grown up working in teams and familiar with concepts like co-creation, co-operation even across geographical boundaries. They expect to continue working in self-managing teams when they enter an organization. 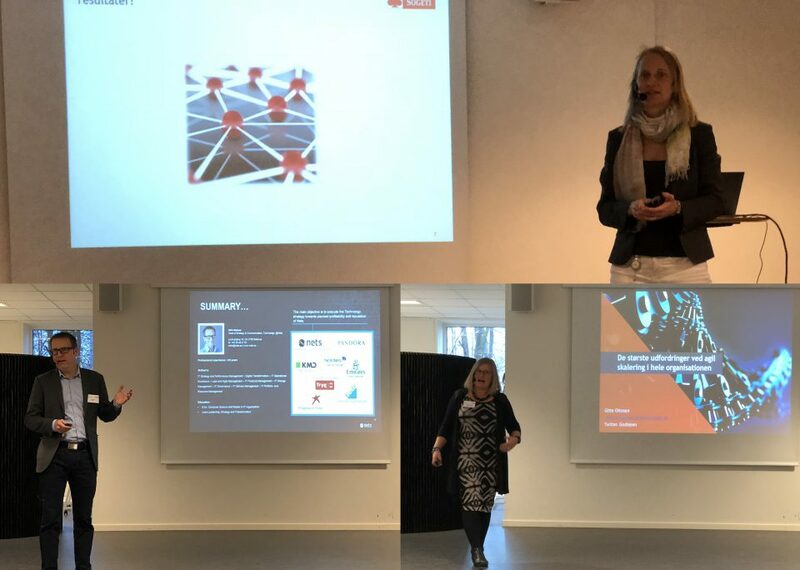 We heard from one of the leading Danish FinTech companies how they are using the SAFe model on their IT Strategy work. Having management working agile not only increase the success rate of strategy implementation – it also gives street credit to management within the IT organization. That is very valuable when you are accelerating organizational change. Last, we heard from a large dairy company that have gone all-in on agile. They have experienced that you should take the name of SAFe very serious – it is just that – a framework. You must adapt and adjust it to your own organization and environment. And continue to do so as things evolve over time. When the floor was invited to join the dialogue – one theme stood out for me: Finance doesn’t get the agile concept! Which makes funding the agile way of working extremely difficult and the same goes for procurement of solutions acquired using agile methodology. The funding itself shouldn’t be that difficult – it’s just like funding a staff function. If you have a team of 7 people for a year you must fund 7 man-years – simple! But you have to report back – and reporting the spend of 7 man-months of salaries back every month is not going to make anybody happy. We need to report back on ROI. But then we still have to fund the acquisition of tools and infrastructure. This should be part of building the architectural runway. Moving to the cloud makes this part easier. But for most existing companies the path to a pure cloud is very long and bumpy. Tenders should move away from bids trying to balance cost, time and quality for a fixed requirements specification towards beauty contests within loosely defined functional and technical boundaries. The resulting contracts should also reflect this change. Coming up with good KPIs reflecting this to the satisfaction of the sponsor and the controllers is still a challenge. One source of inspiration for KPIs is our manifesto for digital architecture. Look at the values and principles and define your quantifiable way of measuring progress and you have come a long way towards meaningful reporting.